Having guests over this summer? Guests want to feel comfortable in your home and have it feel clean and fresh! How can you get clean in a restroom you feel dirty in? Bust out that old, grungy tile and replace with fresh, clean, light colored flooring! Roll up those sleeves and make your money go farther with some DIY projects! Invite your guests in with comfort and style while replacing the backsplash and the 90s counter tops! No one wants to wash their hands in a pink sink anymore, so spring for a lighter look with darker cabinetry. 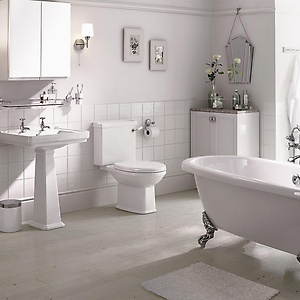 Modernize your bathroom with clean lines and fresh paint! Remember not just to paint over your cabinets but to also check for signs of mold - especially here in San Antonio. Sometimes those old cabinets need replacing with all fresh cabinetry! And while you're at it, check in on the ceiling as well; popcorn ceiling is fairly easy to remove with the right tools! Keep the bathroom fresh and clean so YOU can be fresh and clean! Your bathroom is also somewhere you want to feel safe. Many accidents occur in the bathroom at home so consider some of these great ideas or bathroom renovation for safety: install a walk-in tub or low-threshold shower, invest in slip-resistant flooring, and add safety grab bars in the tub. These are all great ways to renovate your space for the safety of your family and your guests. And since renovating a kitchen or bathroom requires proper disposal of materials, let your family do the fun DIY part and let BTDT do the rest!